Virtual New Zealand Stamps: 2015 Ross Dependency. 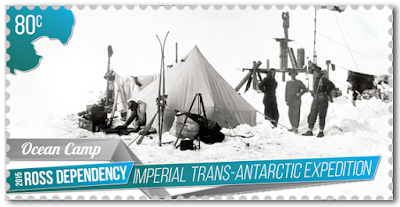 The Imperial Trans-Antarctic Expedition (1914–17), also known as the Endurance Expedition, is considered the last major expedition of the Heroic Age of Antarctic Exploration. Conceived by Sir Ernest Shackleton, the expedition was an attempt to make the first land crossing of the Antarctic continent. After the conquest of the South Pole by Roald Amundsen in 1911, this crossing from sea to sea remained, in Shackleton's words, the "one great main object of Antarctic journeyings". 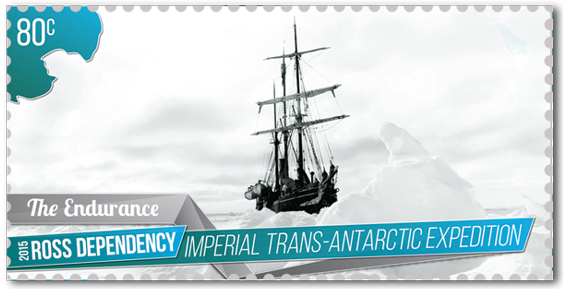 The expedition failed to accomplish this objective, but became recognised instead as an epic feat of endurance. 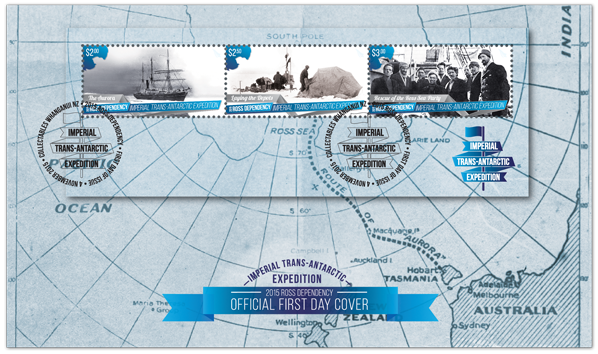 NZ Post looks back about one hundred years to this heroic expedition made up of two teams on opposite sides of the continent — one's tale heralded as the ‘greatest survival story ever told’, the other's as ‘the greatest survival story never told’. 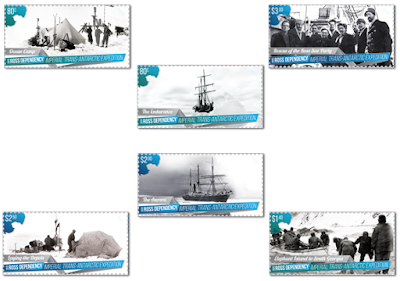 These are six stamps of scenes selected to tell these two stories along with the usual special collectors items. Captained by New Zealander Frank Worsley, the S.Y. Endurance was laden with equipment, animals, supplies and men. Her loss in the crushing pack ice on her maiden voyage was felt keenly by the men. She sank on 21 November 1915; Shackleton, hoisting the blue ensign, was the last to leave. 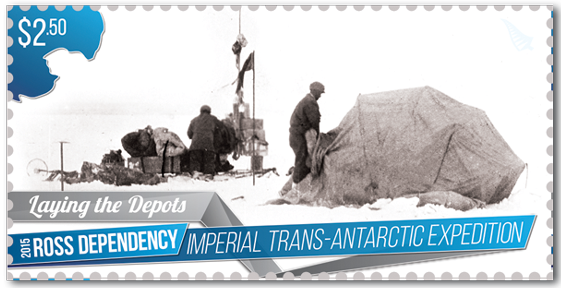 With the Endurance uninhabitable, Shackleton’s men were forced to pitch tents on a substantial ice floe about 1.6 kilometres square. The camp was christened Ocean Camp and was home to the 28 men and their dogs for around two months. Ocean Camp was abandoned on 23 December 1915 as the summer advanced. Shackleton’s men made it to Elephant Island in three small boats, alive but increasingly exhausted. Their hope of survival lay in a difficult sea voyage on the James Caird. The crew of six left Elephant Island on 24 April 1916 and reached South Georgia 16 days later after battling massive seas, ice, exhaustion and thirst. When the S.Y. Aurora was purchased by Shackleton it was old and in need of repair. Captain Aeneas Mackintosh had a few short weeks to set things right. Despite being swept out to sea with the ice, and the loss of her main rudder, she ultimately returned to New Zealand with her crew intact. The Aurora Relief Expedition 1916- 1917 under John King Davis rescued the Ross Sea Party. Shackleton depended on the Ross Sea Party laying depots on the final stage of his crossing. Before the unexpected departure of the Aurora, carrying with it a large proportion of their supplies, the team had managed to lay two depots. A second sledging expedition resulted in the death of three team members. They had completed their task at great loss, although the depots would never be used. With the loss of three of their party, the remaining men, despite some mental and physical ill health, continued their scientific observations. With no option but to wait out the winter, they hunted seals for food and blubber to fuel their stove. Greasy soot from the burning blubber pervaded the hut and covered the men in filth, so that when they were rescued by the Aurora, with Shackleton aboard, they looked like ‘wild men’. There were two miniature sheets were included with this issue, each containing three of the stamps relating to one half of this story. When these sheets are taken and placed onto their First Day Covers their map background fit nicely into the map on the cover. There were four First Day Covers for this issue. 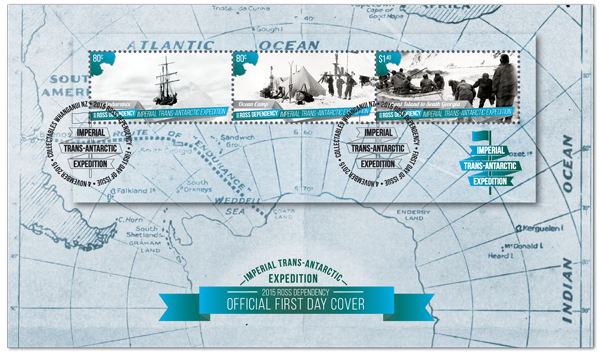 The First Day Cover for the Endurance half of the expedition. 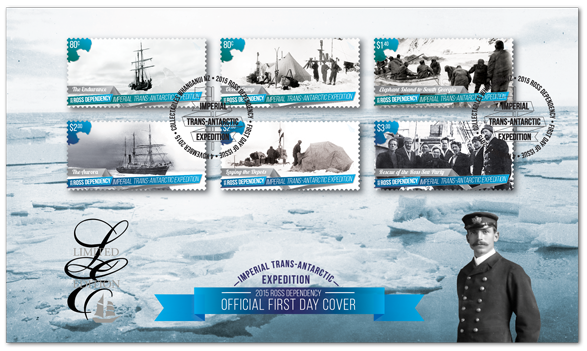 The First Day Cover for the Aurora half of the expedition. 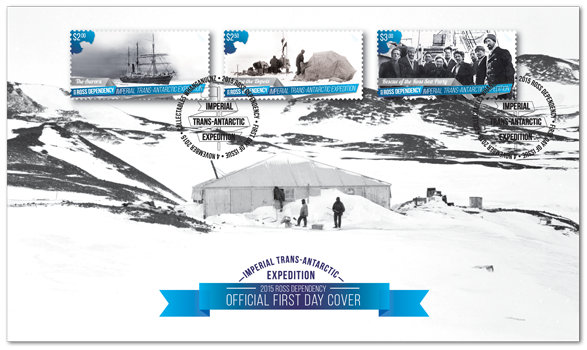 The Endurance Miniature Sheet & First Day Cover. 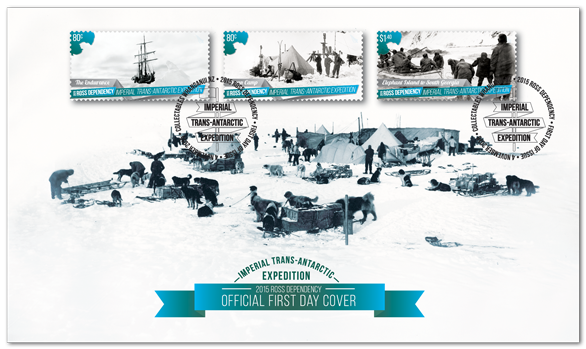 The Aurora Miniature Sheet & First Day Cover. 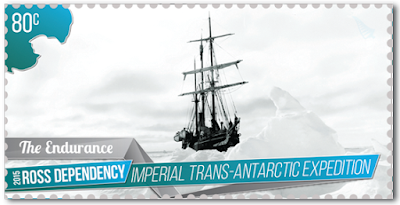 Although the expedition failed to achieve its goal of making the first land crossing of the Antarctic continent (from the Weddell Sea to the Ross Sea), it is recognised as an impressive feat of endurance. Captained by New Zealander Frank Worsley, the S.Y. 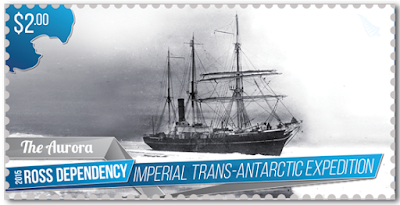 Endurance became trapped in pack ice, resulting in the abandonment of the ship. Despite several efforts to free the ship, it was crushed by the ice and sank in November 1915, stranding the men on the ice. The crew were forced to camp on the ice for months before journeying via lifeboats to Elephant Island. 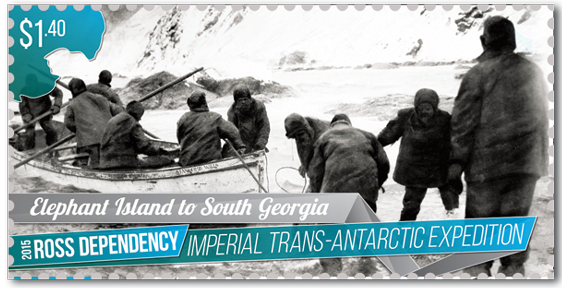 From there Shackleton and five men voyaged in the James Caird lifeboat to South Georgia to effect a rescue. Once land was made, Shackleton, Crean and Worsley marched across treacherous terrain to reach a whaling station on the far side of the island. After many attempts, and 128 days, all 22 remaining men left behind on Elephant Island were rescued. 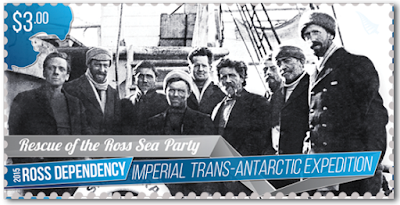 Meanwhile, on the opposite side of the continent, the success of Shackleton’s proposed crossing depended on support from the Ross Sea Party 1914–1917. Sailing from Hobart, Australia, the aim of the S.Y. Aurora's crew was to lay supplies and fuel for Shackleton and his men. Tragedy struck on 6 May 1915 when the Aurora (moored just offshore from the Cape Evans hut) broke free, stranding ten ill-equipped men on Ross Island. Unknown to the men, Shackleton would never make it across the continent; they continued to lay store depots along the route Shackleton had proposed. Sadly three men perished during the expedition; the remaining party was rescued in January 1917 by the Aurora Relief Expedition (1916-1917) with Shackleton aboard. 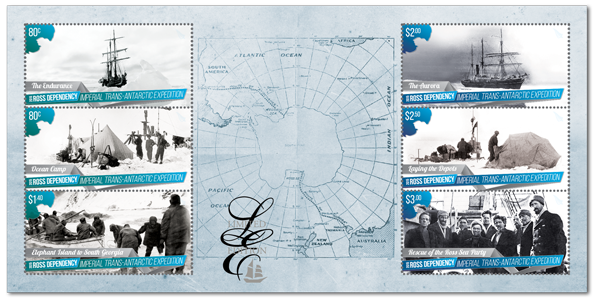 This premium collectable has been produced in limited numbers, and contains exclusive stamp products - including colour separations of the $3.00 stamp, a unique miniature sheet, plate blocks of each of the six stamps and a unique first day cover signed by Rt Hon Paul East CNZM QC, Chair of the Antarctic Heritage Trust. 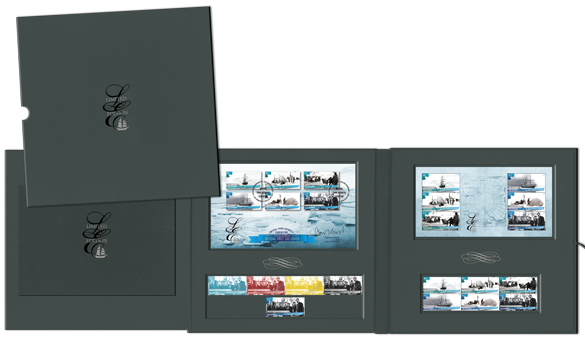 Alongside these exclusive collectables, you’ll find a booklet written by the Antarctic Heritage Trust, which tells the story of the Imperial Trans-Antarctic Expedition in more detail. Limited Edition First Day Cover. Stamps: Tullis Russell 104gsm red phosphor gummed stamp paper. 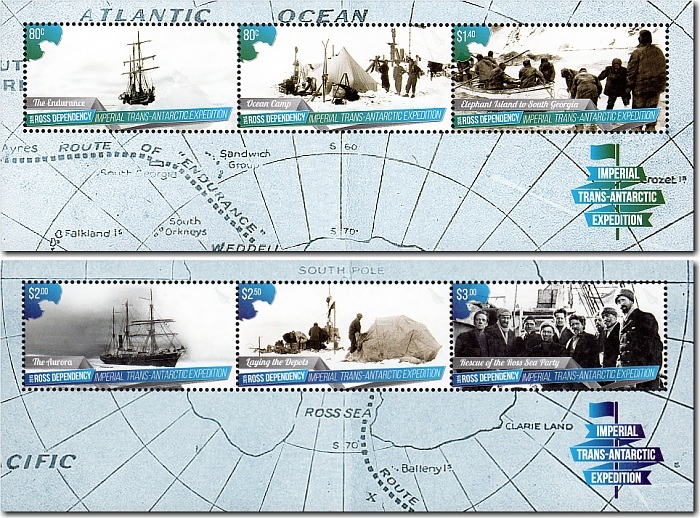 Unless stocks are exhausted earlier, these stamps will remain on sale until 3 November 2016. First day covers will remain on sale until 3 January 2016. An interesting post. You have only done a few new issues for Ross Dependency. Are you going to do the whole series?